Detective Chan Chun (Nicholas Tse) looses his fiancée in eruption of explosions from the hiest. Six months on Chan Chun still mourns his lose and has became a reckless cop who risks his life at the drop of a hat. Carson Fong (Shawn Yue) is a cold badass cop who is taken down a peg when him and his group a torn apart by truck robbers. Junior Officer Wai King Ho (Jaycee Chan) lives in the shadow of his brother who has been missing and seems to be some how related to the deadly group dubbed “The Ronin”. Benny Chan directs a movie that boasts an all star cast starring Nicholas Tse teamed (once again) with Shawn Yue and the new addition with Jaycee Chan. The supporting cast is filled with notable veterans such as Mark Cheng, Ken Lo and Lisa Lu. Shawn Yue’s on-screen love interest comes in the form of cheery Elanne Kong! The Ronin group led by Wu Jing also stars Vincent Sze, Andy On and a female Wu Shu champion! As you can expect the main selling point of this movie is the fast paced, hard hitting, explosive action sequences! The action bend the limits of physical limitation with some powerful kicks delivered from Wu Jing. The only real victims in the movie is panes of glass! When ever a fight kick offs people are sent through panes, left, right and centre! The flick also packs more explosions than a Michael Bay Movie, which leads shows one of the more embarrassing moments of the movie, people diving to void fake CGI explosions, please never again! When the movie comes to stunts, the guys show their chops by taking part in several very dangerous stunts, such as; being struck by buses, jumping from buildings, falling through trees with hard lands and a long fall down a staircase. They takes all the bumps in their stride and we’re reassured with the out-takes during the ending credits where we see the stunts from the behind the scenes footage. One actor whose surprisingly inactive is Andy On physically, but his acting chops are put to test once again. 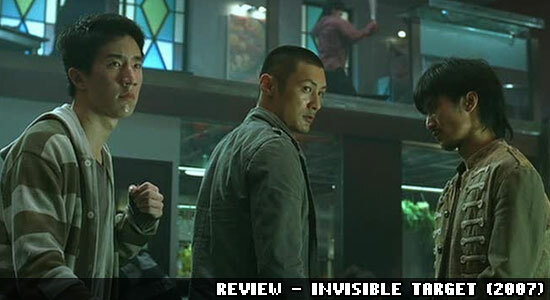 A unique relationship between Andy On and Jaycee Chan pays off for a great dramatic climax instead of the expected fight to death. Overall the movie can be good a times and bad a times, but I find it to be essential viewing! I love this movie. Bought the squishy case 3 disc with the soundtrack. Fiancee is one of my favourite songs. I love the two cliche revenge cops getting schooled by the one real cop. Wu Jing is the best. I’ll watch him in anything.